Although he’d be embarassed to hear me say so, the truth is this: James Patterson is a superhero. His accomplishments are astonishing and inspiring. Check out his biography, which lists too few of his achievements and includes this typically modest understatement, “Patterson is a life-long champion of books and reading.” His ReadKiddoRead program, Pageturner Awards, and books donated to troops overseas are good examples. For literacy work alone, he’s earned my undying gratitude. How about yours? James Patterson built an awesome team of writers including my talented friend Maxine Paetro. You may not know that Maxine authored five books, both fiction and non-fiction, before she began writing with James Patterson. Maxine is married and step-mother to a college student. She also shares her home with six elderly cats and her book characters, of course. She’s created amazing gardens featured in such magazines as House & Garden, Victoria, and Country Garden. Recently, she’s acquired an exotic new hobby. Yes, I’m thinking maybe she’s got a clone! I caught Maxine dashing past during a brief writing break this afternoon and grabbed these revealing answers to readers’ questions. Diane Capri: Okay, Maxine. Spill the whole truth. We’re dying here. Millions of readers worldwide already know that James Patterson is an amazing storyteller. But what’s it really like to work with him? Diane Capri: I’ve had the pleasure of talking with Jim several times, and that’s exactly how he comes across. Especially the generous, funny, and idea-generator bits. Good to know my impressions fit with your reality! Now, readers probably don’t know that you met your co-author years ago when you worked in New York City’s advertising industry. How’d that happen? Maxine Paetro: Serendipity, like many of the best things in life. Wasn’t it Steve Jobs who said life can only be understood backwards? Jim and I were both kids in our twenties. He was looking for his first job in advertising. I worked as a head hunter placing creative people, so I offered him some job-finding tips and that was that. We both went on in life. He landed his first writing job at J. Walter Thompson; I became an in-house head hunter at a number of big agencies. Over the years, from time to time, we stayed in touch. Diane Capri: Was the ad biz really like TV’s Mad Men back then? Maxine Paetro: How would I know? *Laughs* Mad Men takes place in the early 1960s. It’s great TV, isn’t it? Personally, I’m addicted to the series; it’s amazing. I wasn’t working in the business back then, but I’m guessing there’s some truth and some fiction there, like cop shows and lawyer shows, don’t you think? Diane Capri: Well, I never had a case in my law practice that went from new client to jury verdict in an hour, for sure. 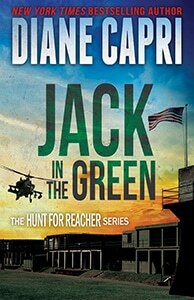 Maxine Paetro: And it takes more than an hour for FBI Special Agents Kim Otto and Carlos Gaspar to figure out they Don’t Know Jack in your new Hunt for Reacher series, too, right? Diane Capri: It surely does. But speaking of real life, your first book was non-fiction, wasn’t it? Still in print? Maxine Paetro: Yes, and it’s been updated a few times. Originally self-published in 1979, never out of print since then, and it was just brought out again by W.W. Norton. It’s about how to get a job in advertising. Diane Capri: After that, you traditionally published three novels. And then what? Maxine Paetro: I wrote several first person adventure stories for magazines. Honestly, they were a little too adventuresome; it’s a wonder I didn’t kill myself. And then I wrote the book that put me back in touch with Jim. Diane Capri: This was Dream Lovers: The Magnificent Shattered Lives of Bobby Darin and Sandra Dee, right? Diane Capri: How did that project reconnect you to James Patterson? Diane Capri: Did you? Bring the cat? Maxine Paetro: I left Pumpkin at home, finished my book, rekindled my friendship with Jim who had by then moved from star copywriter to creative director of JWT, one of the biggest ad agencies in the world, and at the same time, a #1 Best Selling Author many times over. He hired me as a freelance consultant to help him recruit creative people… and the rest you know. Diane Capri: Wow! Steve Jobs was right again; no one could have planned all that in advance. Do you still have the cat? Maxine Paetro: I do! Pumpkin is still in my heart. Diane Capri: You and Jim collaborate to write two books a year now, in the Women’s Murder Club series and the Private series. There’s a new YA series coming out this year, too. That’s a lot of words! How do you keep all those characters straight in your head? Does it make you feel a little schizophrenic? Maxine Paetro: Long ago, when Jim first mentioned his idea for what became The Women’s Murder Club, I had no idea that one day many years later I’d be working with him on this project he created. Now, having written nine books in this series with Jim, I feel very at home with the women in the WMC. When I write Lindsay Boxer, I feel like I’m putting on comfortable clothes. I know how she thinks; I know what she loves; I know what scares her. When I write Jack Morgan, the principal character in Private, I can stretch out. He’s not a homebody like me, and he travels all over the world. The new series is for young adults. It’s coming in the fall and Jim will be announcing it soon. Diane Capri: Okay, I know you need to get back to work. If you miss your deadlines, readers will kill me. But before you go, tell us a little bit about your gardens. Maxine Paetro: Well, you already know I’ve planted a formal Alice in Wonderland English style country garden near the house, which is called Broccoli Hall. In the brick courtyard between the house and the garage, I have an herb garden. And then a cottage garden with an apple tunnel framed with boxwood. Farther from the house, I have a 300 foot rose border. Roses were the reason to have this place and it was more important to me than the house itself. Photographer Jennifer May has captured it well, don’t you think? Diane Capri: Before you rush away, tell us about your new hobby? Maxine Paetro: I’m crazy about my fish, an avid koi aficionado. Koi is a decorative carp that’s been bred by the Japanese for hundreds of years. Without boring you stupid, I’m trying to get a different coloration of a standard fish. I have mud ponds for the koi and they are part of the gardens at Broccoli Hall, too. I’ve got to run, but here’s a picture of my baby ki shusui. Isn’t he gorgeous? Serendipity, a fortunate meeting made by accident, led Maxine Paetro and James Patterson to a successful working relationship that’s endured for decades, to the delight of readers the world over. We can’t see the future, and as Steve Jobs said, can only connect the dots in the path of our lives looking backward. What’s the most interesting serendipity experience you’ve ever had in your life? Anything as significant as what happened to Maxine Paetro when she met her future co-author all those years ago? Thanks, PJ! Maxine is a very interesting writer involved in a terrific collaborative gig, isn’t she? I love it when great success happens to hardworking writers, don’t you? The one things that comes across clearly is that Maxine didn’t just fall into her career. She worked like crazy at it. There’s a tendency to think that serendipity is all but the work ethic behind it is the force that brings the success. So true, Martha. I’m always impressed by the “overnight success” stories because so rarely does anyone mention the years it took to get there. Thanks for stopping by. I loved this interview! Great job. I can’t fathom handling all those books at the same time. I can see the appeal of gardening and now Koi — probably good for relaxing and reflection, assuming there is time! 😉 And now I want my own little baby koi!! Really? A baby koi? yiyiyiyiyiyi! I like pets I can, well, pet. You know? But Maxine says these little babies are soooooo seductive. Be careful, Ginger — you may find yourself with mud ponds in your back yard if you’re not careful! Thank you for this interview. It’s informative and a zippy read. I’m impressed with Maxine’s writing journey, work ethic, and, those glorious gardens. You are so right about those gardens, Pat! Just beautiful, aren’t they? I love to visit gardens, but I have a total black thumb — and an aversion to hard physical labor! Thanks for the kind words on the interview and the amazing Maxine! I LOVE the women’s murder club. What a treat to learn more about Maxine, Debra. Thanks both of you for this wonderful interview! Maxine will be so thrilled to hear you’re a fan, August! Great interview Diane! Man, what a juggling job with the books and hobbies. Wonderful! You bet, Deb. Many authors dream of being hugely successful without a clear understanding of the time and energy commitment it takes. Stories like Maxine’s remind us of the rewards for all that hard work, too! You are so right, Alan! I always feel like a slug when I talk to Maxine!